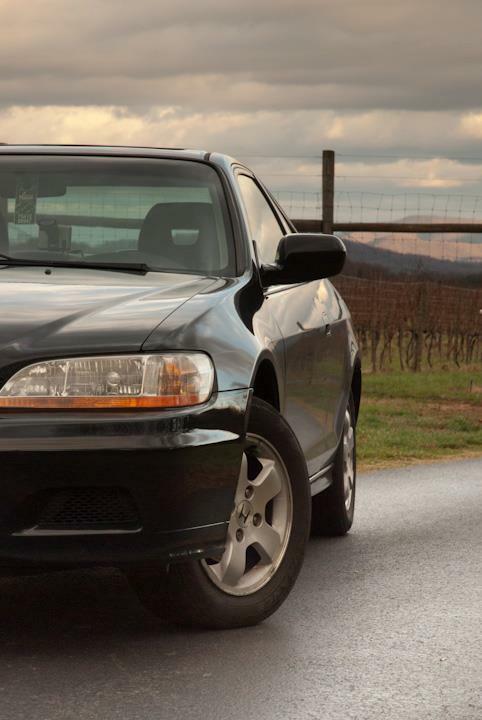 After the 1999 Accord was deemed a total loss, I ran through about a dozen different cars that I thought I wanted. I looked at everything from Subaru's to Mercedes Benz to BMW. I thought for a bit that a Subaru Outback would be the best car because it is a great combination of all-weather go-anywhere traction and incredible reliability and longevity. While I was selling Subaru's I routinely saw them traded in with well in excess of 200,000 and one in particular with over 350,000 miles. I went to look at the Subaru I thought was the perfect car. It had great miles, was the right body style, and transmission. However, when I got to the dealership to look at it it was suddenly $1000 more than what I had agreed to on the phone with the dealer, so that one was crossed off the list. After that setback, I realized that there weren't really any cars out there in the Subaru line with the miles I was looking for in the price range I wanted, so I started re-thinking what I was looking for, and ended up right back where I was before...looking at Honda Accords. After a few days of searching, I actually ended up finding a 2001 Accord EX Coupe within my price range with the miles I was looking for, in the right color, with the features I wanted. All in all it took 23 days to go from being in the accident to finally owning my replacement car. Since I purchased the car I've driven approximately 670 miles, and can say this: the car is wonderful. There are small things I miss from the previous one, but overall the decision to take this car over the others out there was good. One thing that surprised me is I really did not sacrifice any utility in going for the Accord Coupe over the Accord Sedan. The coupe looks better, but other than that everything from the Sedan carried over, including the trunk space, which I feel is actually more usable in the coupe than the Sedan because of how the opening is cut. The first 670 miles actually included the car's first road trip with me. I'm working on planning a few more for this summer and for my winter break from school which is coming up. I won't write much on the first road trip as I wrote about everywhere I went back when I had the Volvo. You can read the post here. I will, however, have a more complete updated review on Afton Mountain Vineyards posted in these pages shortly. As it is in final review and drafting it won't be released until next week sometime. October 25th was a normal October morning here in the DC metro region. I woke up late, the sky was clear, the air was crisp. The leaves left on the trees were glowing shades of orange, red and yellow. I left for school, and headed down my normal route, 28 South to the Dulles Toll Road. At one point along the way traffic always backs up from people merging off of the Dulles Greenway and on to 28 South. Unfortunately the Virginia Department of Transportation hasn't bothered upgrading the interchange to accommodate the amount of traffic that passes through it on a daily basis, so those of us coming from the north are met with sudden slow downs, and delays. Every single morning I pass through that area, my thoughts have been "Is today the day I'm going to get rear ended". After several close calls, October 25th was the day. I was changing my radio station to our local News Traffic and Weather station just to hear what I could expect on the rest of my trip down when the car behind me decided the traffic back up did not apply to him. 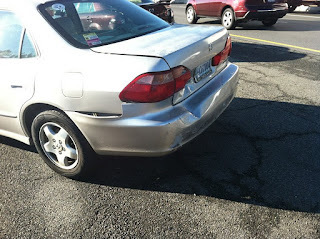 He was traveling about 35 miles per hour and slammed into the back of my 1999 Honda Accord, so hard, in fact that he pushed me into the car in front of me, seriously damaging both vehicles. The damage pictured doesn't look like a lot, but it was well in excess of $7,000 to repair a vehicle that only has a market value of $6000. My insurance company determined they were better off keeping it. I, fortunately, was not injured. The responding police officer mentioned that if I had not had my head rests adjusted properly, I very likely could have had serious neck or back injuries. The moral of the story is this: your head rests may not be comfortable, but the closer it is to the back of your head, the better for you it is. Always adjust them accordingly. Earlier this week I purchased my replacement vehicle. I will post on it within the next couple days, but for now my boss is waiting for me to get back to work. Pictures soon to follow, but as of October 25th the Honda is out of the fleet. I was rear ended on my way to school, and the car was written off as a total loss. Watch soon for my replacement vehicle!